A portable essential oil diffuser is exactly what it sounds like. It’s a smaller version of a regular essential oil diffuser that runs on batteries, by plugging it into a USB port, or by plugging it into your car’s cigarette lighter. They’re usually smaller, and some can even fit into the﻿ palm of your hand. They’re lightweight as well, and this can make them very easy to take with you. However, most of them usually run for shorter periods of time as well, and this is due to their smaller sizes. 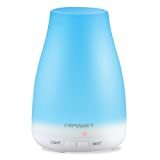 Portable essential oil diffusers are great for smaller rooms or enclosed spaces where a larger diffuser could get overpowering. 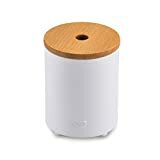 For example, if you have a small glassed-in porch that you use to enjoy the warm weather, a portable essential oil diffuser can fill the space with your favorite scents without overpowering you. Just like any diffuser you can buy, there are a few types of portable essential oil diffusers available. You can buy one kind or a few to ensure that you have everything you need to enjoy your essential oils while you’re on the go. Some essential oil diffusers have batteries built in, but they also plug into your standard wall plugin. This gives you added flexibility to use your diffuser on the go, or when you’re relaxing at home. These smaller portable essential oil diffusers run on battery power. You typically get between three and four hours of run time before you have to refill it. They’re a great option if you want to run it to freshen up a smaller space. The third type of popular portable essential oil diffuser actually goes right in your car. It sits in your cup holder. You plug it into your cigarette lighter port in your car to run it. It can run for a few hours, and it shuts off when you shut the car off. USB essential oil diffusers plug into a USB port on your PC, tablet, or laptop. Some have batteries that charge through your USB port, and others need to be plugged in to run. Several advantages come with using a portable essential oil diffuser. If you’re a busy person, you may want to check into them. I’ve picked out the best reasons you should consider getting a portable essential oil diffuser below. Did you ever want to take your essential oils with you but you don’t have something convenient to put them in to ensure they don’t spill? If you commute to work as my husband does, it’s not practical to carry essential oil bottles in your car, especially during the hot summer months. This portable diffuser lets him relax on the way to and home from work. Traditional essential oils can get messy if you try to use them on the go. Once you spill the oils and they get on your hand or clothing, it’s very hard for them to come off. Portable essential oil diffusers give you a containment system for your essential oils, and they usually sit securely into your cup holder in your car. This reduces the chance of a spill or mess. The smaller design adds to the portability of this type of device. They’re usually made out of durable materials that can survive different environments. Additionally, they’re usually lightweight and small enough to pick up and take with you when you’re on the go. If you have a smaller room or an enclosed space like in your car, it can be difficult to enjoy an essential oil diffuser that doesn’t overwhelm the space. This is where smaller portable essential oil diffusers excel. They usually do well in smaller spaces without overwhelming them with the scent of the oils. Larger essential oil diffusers are great for home use. But, they’re not practical for use outside or even in your work environment. You can easily take these portable essential oil diffusers outside or to your job without worrying about overpowering anyone. The smaller design also ensures that it won’t take up a lot of valuable desk space. How you use your essential oil diffuser depends on the type of portable diffuser you buy because some use water and some don’t use it. However, possible ways include the following. If you have a portable essential oil diffuser that takes water, you add the recommended amount of water, a few drops of your oil, and close it. Next, you’ll either switch it on if it runs on batteries, or plug it into your USB port or cigarette lighter plugin. This should start the diffuser, and it’ll run until it runs out of water or you shut it off. Other types of essential oil diffusers use a pad and a fan. You add a few drops of essential oil to the pad and put the pad in the diffuser. Once you close the lid, you can switch it on, and a small fan will work to disperse the oil throughout your space. It runs until you shut it off or it runs out of batteries. You can also find portable essential oil diffusers that don’t use water to run. Instead, you add a few drops of pure essential oil and plug it in or switch it on. It’ll force microscopic drops of essential oil out into the space, and it’ll run until it runs out of oil or until you shut it off. There are a few buying considerations that you want to keep in mind when you start to shop for your portable essential oil diffuser. This can help you get the correct one on the first try. You don’t want to burn your portable essential oil diffuser out by accidentally running out of water. Make sure that your diffuser automatically turns off when it runs low on water. This can help to improve the diffuser’s longevity. How your portable essential oil diffuser gets power will determine how easy it is for you to use it. If you plan to run it in the car, batteries or one that plugs into a cigarette lighter is a good choice. For office use, one that uses batteries or a USB port is great. Most of these smaller diffusers only run for a few hours. You really want to pay attention to the run time if you plan to take it to places with no hour source to ensure that it runs as long as you need it to run. Even though the diffuser is most likely completely enclosed, you want it to be stable. This is especially important if you plan to use it in a moving vehicle. 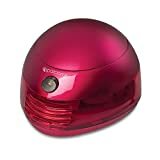 This red metallic portable essential oil diffuser allows you to plug it into your device’s USB port to run, and it also runs on batteries. It comes with three micro-absorbing fragrance pads for you to put your essential oils on. You’ll get a silent operation from this palm-sized device, and this is excellent for use in a crowded office. It emits a soft blue LED light when you plug it in. Additionally, you get a very wide and solid base that helps to ensure the diffuser stays where you put it. This portable essential oil diffuser adds moist, cool air into your bedroom when it runs. You’ll get seven lighting options and colors that act as a soft nightlight, and this diffuser can run for up to six hours. It features an automatic shutoff that works to prevent the diffuser from burning out when it runs low on water. You can have it diffuse constantly or at intermittent levels throughout the night. You get a whisper quiet operation combined with a stable base that plugs into the wall for a continuous run time. This sleek and slender essential oil diffuser fits perfectly in your car’s cup holder. It’s a fan diffuser that doesn’t use any water or heat, and this reduces your chances of spilling anything or having a mess in your car. You can run it from a USB interface or on three batteries, and the sleek wood top blends beautifully into any car’s interior. The small pads make it easy to swap out your essential oil or oil blend before you start your commute. Finally, it has a stable place to keep it upright. For people who have dry rooms or who live in arid climates, Meidi’s portable essential oil diffuser adds moisture to the air. It expels a cool mist along with your essential oils when you have it on and running. It features a sleek and slim design, seven LED lighting options, a whisper-quiet operation, an automatic shutoff, and two different mist mode settings and control options. You can set it to run continually between 5 and 10 hours, and it plugs into your USB port to charge. 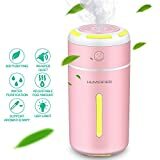 This portable and compact essential oil diffuser is excellent for nurseries. It features soft light that acts like a miniature nightlight. You can plug it into the AC adaptor, mobile phone charger, USB port, and a car USB power supply. It has two buttons to control the mist and light. It has an automatic shutoff function, two light modes, two mist modes, and seven colors. This has an ultra-quiet design that’s great for running overnight. It runs with water and two or three drops of oil, and it has a wide base for added stability. Portable essential oil diffusers are excellent for people who are busy and want to take their essential oils with them. My simple guide gives you great points to watch for when you start to shop for your own. I also outlined five portable essential oil diffusers that give you a good idea on the different types of portable essential oil diffusers that are available. Go out, shop, and find the best one to suit your needs!